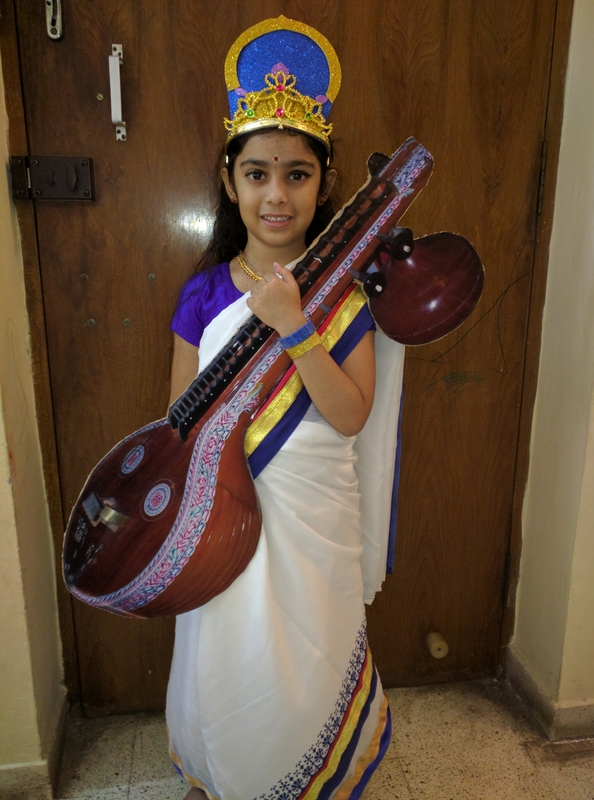 This is a post on how a costume of Saraswati was put together for my 5-year-old daughter Santoshi . 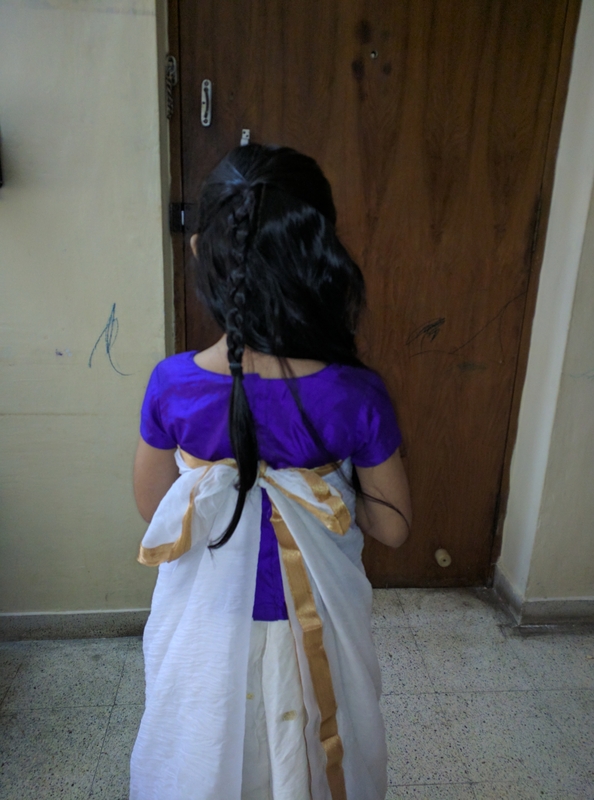 On the last day of school before the I Term holidays, Santoshi woke up earlier than usual just to tell me, “My teacher asked me if I would like to dress up and go on stage. I told her that I’d love to”. I did not think much about this, though the teacher had promised all parents that all the students would get an opportunity to perform in one way or the other during the academic year. Strangely, the school informed us about ten days in advance that she has been chosen but did not reveal more information until the day before the show. I was excited because Santoshi likes to dress up and I love experimenting new things/ ways of doing things. 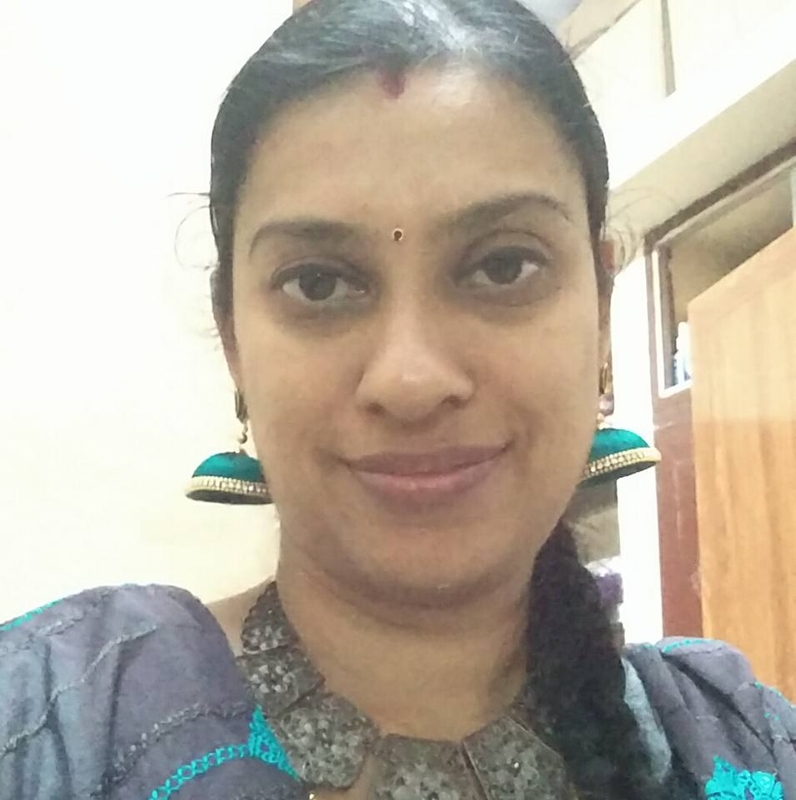 With the limited information that was provided to us, we needed a white silk saree with gold trims and designs, a bright coloured blouse in contrast to the white saree, a veena, some jewels (crown, necklace, bangles) and face make-up – eyeliner and bindi and, may be, a dash of lipstick. 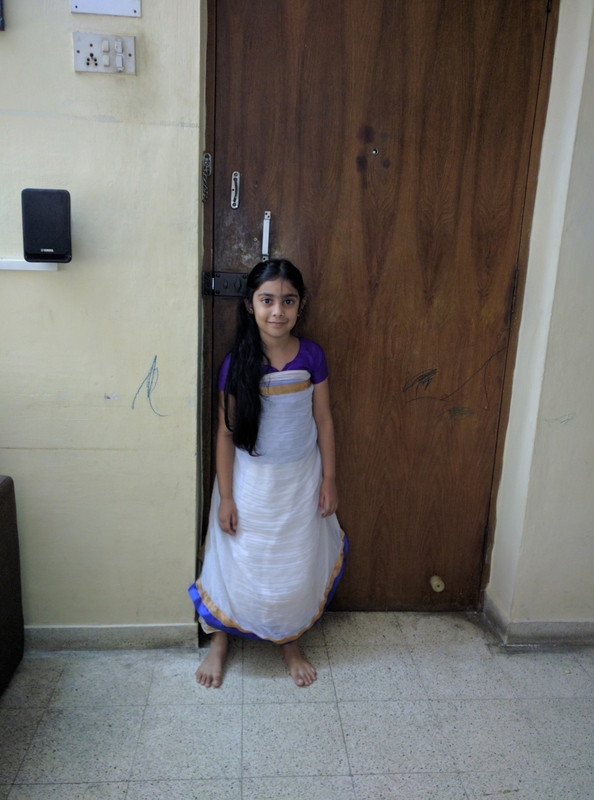 Santoshi did have a set of off-white skirt and blouse which may be acceptable by the school but I was not happy with that. So, I started looking for all the white coloured clothes/ fabrics that were at home. I had ordered this for myself and I still had the fabric for the salwar unused, looking pristine white. With more than two metres in length, it was the best choice for the white ‘saree’. 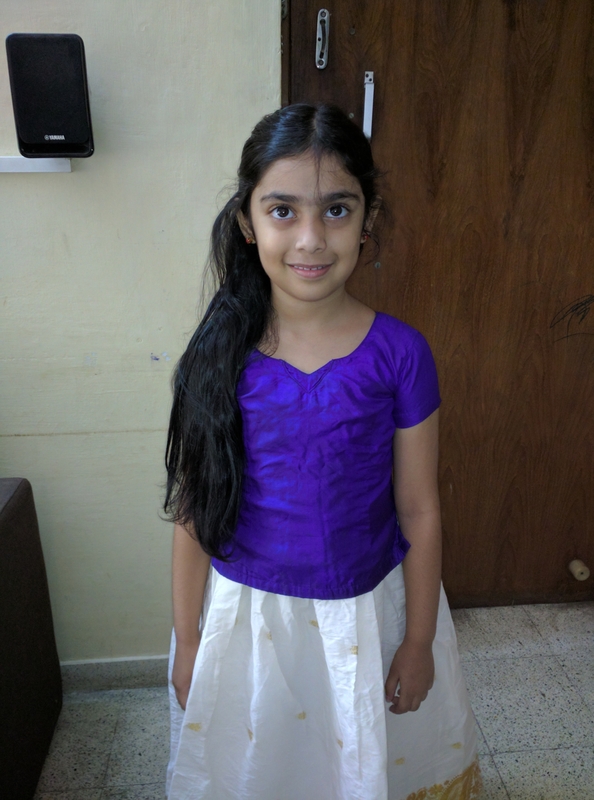 Santoshi still needed a white skirt to wear underneath. So, I bought a thin white dupatta with gold trims to be tied over the white skirt. In order to team the white fabric with blue trim with the dupatta with gold trim, I bought two metres of gold ribbon and two metres of blue ribbon and attached them to the respective trims. Now, they looked close to a white silk saree. Bright coloured blouse for the saree – we chose a dark purple blouse which was close to the blue trims of the ‘saree’. Wrapping – Santoshi wore the purple top over the off-white skirt. Aligning the trim at ankle level, the white dupatta was wrapped around her at chest level. It was secured with a knot at the back, just tight enough so that it wouldn’t slip. Next was the other white fabric to which I added the gold trim – it was pleated and secured on her left shoulder with a safety pin, with one of the fabric falling behind her shoulder for about one foot. The rest of the fabric was wrapped around her and the other end was pinned to the dupatta and the blouse near the waist. I took a print of photo of a veena on vinyl material and cut it to shape. The print out was turned over, glue applied near the outline and pieces of cardboard were stuck on it to give it a firm backing. 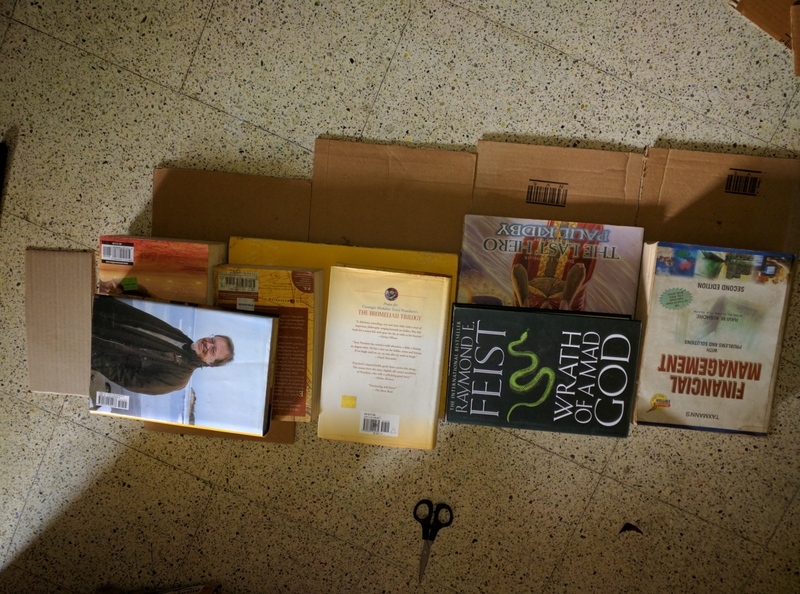 I used heavy books to press the cardboard to the vinyl material. After the glue dried, I cut the excess parts of the cardboard, which I realised was a mistake. First, I should have drawn the outline on the cardboard and cut it to shape and then glued it to vinyl. This is because cutting the cardboard with the print out on top was very difficult and I was running the risk of ruining the print out. The print out was about three feet in length and I did not have a piece of cardboard than was as long. 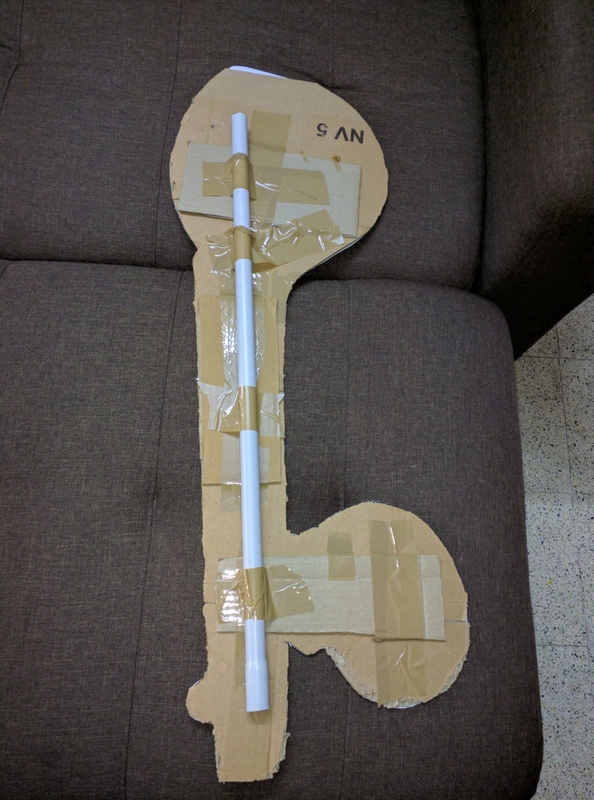 Instead, I had four smaller pieces of cardboard which made the veena bend at every joint. I wanted to add a long strip of cardboard for the entire length to prevent bending but then a light bulb went ‘ding’ above my head. 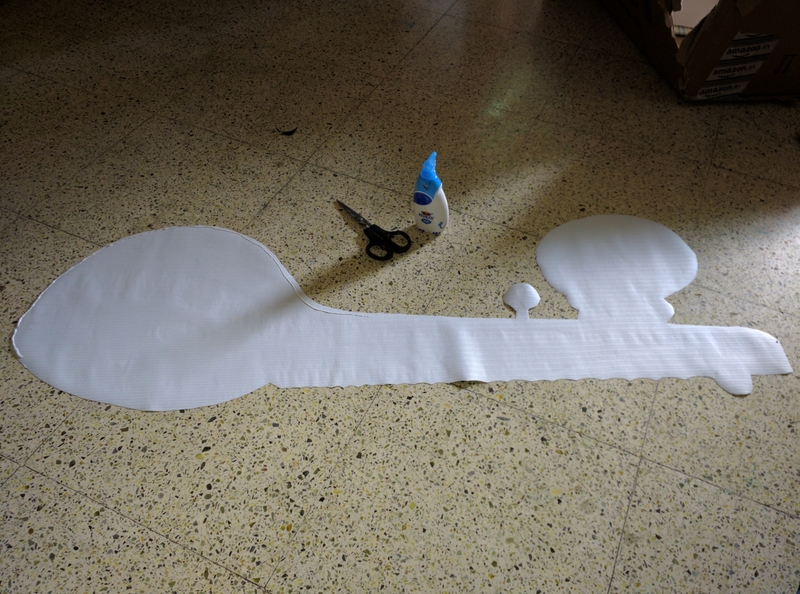 Last year, I had made a mop with a lightweight PVC pipe as part of the costume for cleanliness dance. 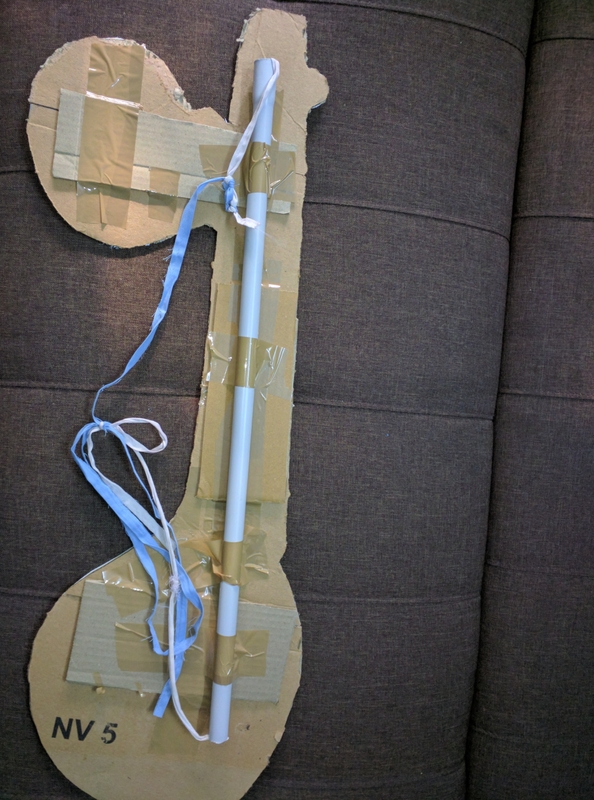 With packing tape, the PVC pipe was attached to the veena which gave it a rigid, firm backing, yet keeping it lightweight. The hollow pipe was perfect as loop for the string which was used to hang the veena across. I bought a gold colour crown from a local store along with a set of glitter foam sheets. The saree was white and blue. So, I used superglue to attach the blue glitter sheet with gold trims behind the band that rests on the forehead. The crown already had a clip/comb-like end on both sides to secure it in place on her forehead. I couldn’t find bangles of her size in the colours that I wanted. So, I cut the glitter sheets into thin strips and taped them together around her wrists. An imitation gold-colour necklace that we already had. I didn’t add more in terms of necklaces or long chains because one, it may be uncomfortable for her and two, the veena will be hung on her shoulder across her body, hiding any more jewels. She wore a black eyeliner with a golden dot at the end, a red bindi and a light pink lipstick.